Judy Patterson is the mother of Inverurie skier Callum Smith, who has been competing at the Winter Olympics in Pyeongchang. She has been following his fortunes up close in South Korea. “It’s really comfortable… but there are no chairs and no beds!” was my reply to Callum’s text inquiring about our Korean accommodation for the Winter Olympics. I am sharing the flat in Jinbu, South Korea, with three parents of two other cross-country Skiers on Team GB. It proved a great comfort to be able to share the ups and downs of my 12 days stay with fellow parents who not only had a detailed knowledge of the sport, but also shared an understanding of that special kind of emotional indigestion common to family members of competing athletes on the world stage. A few days on, sleeping on a pile of quilts on the heated floor (Ko style) and sitting on the floor to eat our meals from a low coffee table seems quite normal, though still not entirely comfortable – memory foam mattresses still get my vote. We have had our challenges due to the exceptionally cold weather at the start. So cold that our Airbnb flat’s water supply froze up for 24 hours. No flushing loo may be a good way to get to know one’s flat mates’ responses to adversity, but not otherwise recommended! Jinbu is a quiet rural mountain town on the outskirts of the ultra-modern Pyeongchang Olympic complex. Apart from winter sports the area’s claim to fame is the bitter dry Siberian wind that provides just the right conditions to dry the huge wooden racks of hanging sea fish fillets dotted through the valleys. I have found it not so great for the human complexion either! Alongside seaweeds, fungi and kimchi, dried fish is a Korean national delicacy. We had the pleasure of wandering through the traditional market one morning marvelling at the range of roots, fruits, wild vegetables and fresh and desiccated foods seafood ranging from bags of tiny minnows to leathery whole skates and frozen purple-skinned octopus. Street food is good – steamed apple filled buns, savoury pancakes, savoury dumplings. Another day a short bus journey took us to a working Buddhist monastery set in one of Korea 46 National Parks. I found Korea to be a friendly and intriguing country, worth a lot more exploration in the future. But of course, the real reason for the trip was to support our boys and the rest of Team GB at the Winter Olympics. 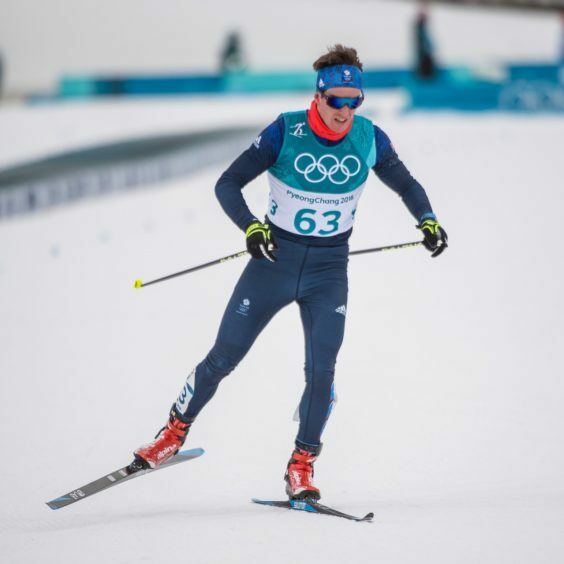 Callum Smith in action in Pyeongchang. Along with the flags we carry to the slopes the gut felt empathy for their hopes and dreams, the respect for the huge investment of energy, time and resources that goes into getting to the Olympics (especially in such a brutal sport), the fear of athletes’ disappointment in a difficult race, and the understandable but sometimes fickle public disinterest in any placing outside of a medal position. I find myself more impressed by every Olympic athlete’s journeys to qualification now I know what it takes. The first cross country race was the 30km ski-athlon, which we watched from a platform above the stadium. To stake a claim on a patch of railing with a view of the big screen and a camera placement we needed to arrive 2 hours before it started. At -12 degrees in a bitter wind, this tested both our thermals and our dedication. Callum went out strongly in the mass start and his first lap was fast, but seemed delayed returning to the stadium. The TV showed a Union Jack printed race suit in the tangle of limbs following a pile up around a faller. I heard later that Callum had ploughed into the back of him and been winded. He reflected later he was gutted to have missed his chance to follow through on his strong form by losing the group he expected to ski with and overtake. Andrew Musgrave however had a stormer of a race, keeping us on the edge of our seats. He came 7th, a magnificent achievement for a small no snow nation and fuelled speculation about his medal potential later in the Games. The next big race for Callum and his team mates (Andrew Musgrave and Andrew Young), was the 15km Freestyle, where he was aiming for a top 40 places. All three lads were racing, with pressure on Andrew and the Musgrave parents with all the talk of a medal. Such is the pain of sport that both lads had a bad day, for no obvious reason, and finished well down on expectations. So painful for the athletes after the years of training involved, but we also felt their pain in the stands, our supporters’ flags and smiles visibly wilting as the race progressed. Sport certainly teaches resilience skills. 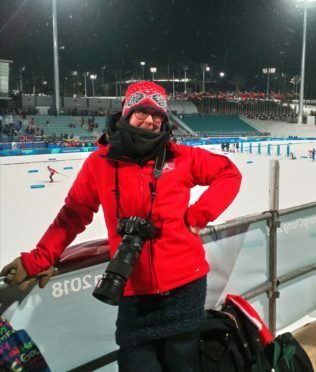 My 12 days in Pyeongchang have focused mainly on cross country events, but we did also watch ice hockey, biathlon and speed skating. It takes a while to work out the logistics of transport, but the Koreans did a fantastic job of moving people around on a huge network of free buses. As parents we don’t expect to see much of the athletes, they need to focus on the job in hand. However, on my last night in Korea Callum met me for a meal and handed over some Olympic prizes for his Inverurie loyalty card prize draw. Everyone is welcome to participate. The draw will take place on the February 26 at the Kilted Frog in Inverurie. Look out for the posters in other participating businesses round town who will sign your loyalty card (extras available in the Kilted Frog) and hand in completed cards for the draw. Each participating business has agreed to contribute towards Callum’s training funding. He will be back home to Inverurie in May and intends to offer talks to schools and other interested groups in appreciation of local support.